Kokrajhar, Aug 22 : It has been more than a month since ethnic violence broke out in parts of lower Assam. Ever since then people there have been tense, angry and scared. Nearly two and a half lakh people, both Bodos and minorities, are still in 224 relief camps, although two lakh people have returned to their homes. There is a sense of distrust running deep among people who were neighbours till a few weeks ago, and that is preventing them from returning to their villages. Large scale destruction is yet another reason that's keeping people away from their villages and in relief camps. "Our biggest challenge is reconciliation. People have to realise the interdependence, that they need each other. We are organising meeting among leaders," said Jayant Narlikar, Deputy Commissioner, of Kokrajhar. For now, there is safety in numbers in these camps. At the Hapsara relief camp in Bongaigaon district, the government has provided water filters, hand pumps and a mobile medical unit with doctors. This may blunt the attack on the state government, blamed for the poor hygiene in the relief camps, but camps continue to be over crowded, with people cramped in claustrophobic space. "What improvement? We are all living here without any self-respect, women and children... There's no power and we live in darkness," said one of the inmates of the relief camp. In Kokrajhar, one of the worst affected districts, the Titaguri relief camp just outside the Kokrajhar town now wears a deserted look. Some of the men have returned to their villages a few days back, but the women are still here. One of them wonders, why can't life be the way it was. "So many leaders like Sonia Gandhi and Tarun Gogoi have come, and many others too. They said that they will help us find a solution to all these problems, but nothing has happened. 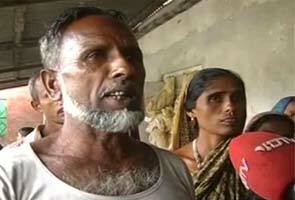 We just want to live a normal life," said Chandana Goiyari, an inmate of the relief camp. Different camps, different stories. But all have the same feeling - how soon can they return and why live as refugees in their own land?